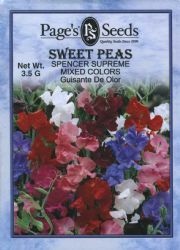 This old-fashioned sweet pea has very fragrant little flowers that bloom on long, slender stems borne on a leafy vine. They grow to 4-6' in a season. Quick growing and twining, they can be trained on string or wire. Prefers cool air. Flowers appear in mid-spring with masses of blooms from purple to pale lavender, ruby red, pale pink, white and bicolors.